(Bloomberg) -- An oil tanker hauling Iranian crude is making the first delivery to Chile in at least 16 years, a sign the Persian Gulf country may be seeking out new customers for its oil in the face of renewed U.S. sanctions. The Monte Toledo, a Suezmax-class tanker able to transport 1 million barrels, is due to reach the Pacific Coast port of San Vicente on July 12, according to signals from the ship. It exited the Persian Gulf earlier this month after loading at Kharg Island, Iran’s main export terminal. Iran is battling to keep customers around the world after U.S. President Donald Trump said a month ago he would reimpose sanctions on the country, a measure that’s left buyers uncertain whether they’ll be able to continue purchasing, and on what scale. Chilean government data show the country hasn’t imported any crude from Iran in at least 16 years. ENAP, which has a refinery at San Vicente, wasn’t immediately available to comment. 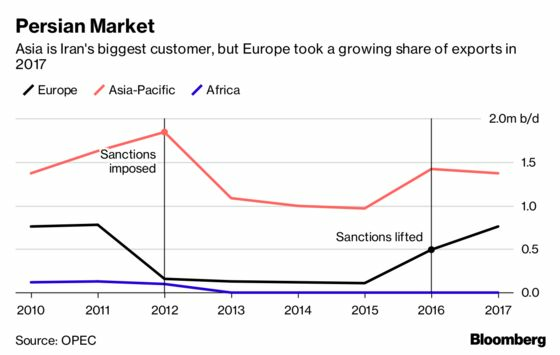 In Europe, refiners and traders are still awaiting clarity as to whether they’ll be permitted to make proportional reductions in purchases from Iran -- or be forced to halt such trade altogether. In India, the refining giant Reliance Industries Ltd. hadn’t decided at the end of May if it would stop importing oil from Iran and was waiting for direction from the government, people familiar with the matter said at the time. When Trump re-imposed sanctions on Iran on May 8, he gave buyers of the country’s oil 180 days to reduce their purchases or be shut out of the U.S. banking system. Since that initial announcement, several European refiners said they’ve received no indication from Washington or their own governments about what they should do next. The European Union sent a letter to the U.S. Treasury on June 4 asking for exemptions from sanctions.